A Gents sympathy handkerchief to convey your condolences on the loss of a loved one. A Gents sympathy handkerchief to convey your condolences on the loss of a loved one. 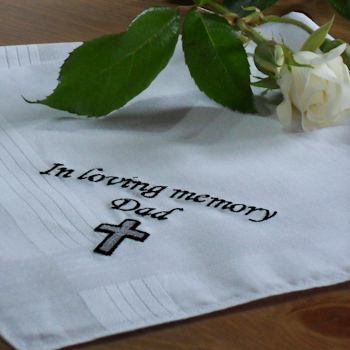 This personalised memorial handkerchief is a comforting bereavement gift. Select from a personalised mens cotton or pure Irish linen handkerchief. A Gents sympathy handkerchief to convey your condolences on the loss of a loved one. This personalised memorial handkerchief is a comforting bereavement gift. Select from a personalised mens cotton or pure Irish linen handkerchief. Embroidered with a brief message or a persons name in a letter font style and thread colour of your choice and a holy cross motif.